Merchants have the ability to resend a receipt for a transaction that previously occurred on their devices by locating it in the Transactions list. Once identified, tap on the Transaction list you'd like to review. The transaction details will appear and may be reviewed. 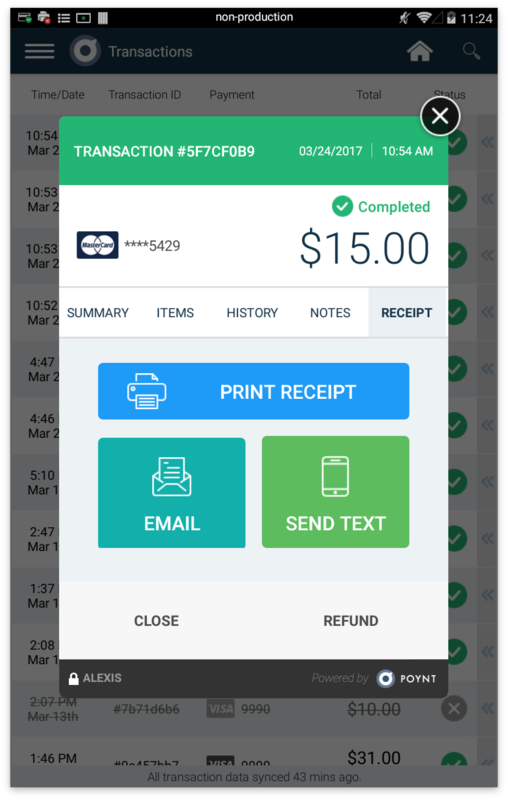 Select Receipt to resend or reprint a receipt. To reprint the receipt, select Print Receipt from this screen. Alternatively, if a customer requests a receipt and they were the last transaction that occurred on the device, you may find a "Print Last Receipt" option in the three dot menu on the top of the Terminal or Register App.